David Hughes, known as Dave, was born on 12 June 1938 in Gatooma district, then Rhodesia and educated at Umtali High School. He served an apprenticeship as a distiller at African Distillers in 1956 and filled several positions before moving to South Africa in 1986. Operations manager SFW (Stellenbosch Farmers Winery, now Distell) Transwaal, General manager SFW Natal, Winery Manager SFW Stellenbosch, Marketing Manager Consumer Relations SFW until 1989. 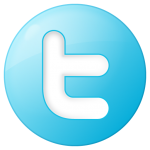 Independent and Freelance since 1989. 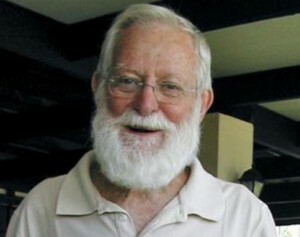 He founded the Cape Wine Academy in 1979 and appointed Phyllis Hands as the first principal. He has been involved with the Nederburg Auction since its inception in 1974 and is still a consultant. Consultant to Veritas national Wine Competition, South African Airways Wine Selections and to the International Wine and Spirit Competition in Britain. Played Rhodesian provincial rugby, water polo, hockey and basketball. Rhodesian junior breastroke champion, Rhodesian Army Cross Country Champion (Running). He has completed 10 Comrades Marathons. Life Member of the International Wine and Food Society Invited in 2001 to join Worshipful Company of Distillers. The first non-resident of Britain to be given this honour since the guild was formed in 1638 to control and protect the production of spirits in the city of London. 2011: Wine legend, wine writer and wine ambassador Dave Hughes has been honoured by the South African Port Producers’ Association (SAPPA) for his contribution to building the image of Port in South Africa and internationally. Dave and his wife Lorna were gracious hosts on many occasions. A lot of wine and conversations were enjoyed! Bill and Roy at Daves house. Bill: What was your ”A-ha” wine? 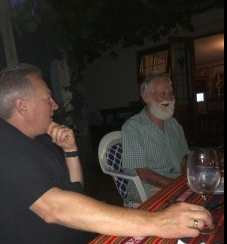 Bill: Who was your winemaking Mentor? Dave: I was not lucky enough to have such a person. I was a lone little lad in the then Rhodesia so learned most of what I was doing from books and papers. I wrote to folk in South Africa and Europe and then experimented on my own. By the time I was making wine in South Africa, I was looked at as a ”mentor”! Bill: Favourite place to judge wine? Dave: That is very difficult. I suppose the UK in that I have judged there annually for more than 40 years. For some seven years, I spent about six months of the year judging mainly in the UK at the International Wine and Spirit Competition. However, I thoroughly enjoyed my judging visits to Slovenia. Also Portugal, Spain and, of all places, the Netherlands! I have enjoyed judging in USA, Mexico, Canada, Italy, Australia and various others. Bill: Not visited but would like to? Dave: I am not sure of the exact date. It was when he was building the winery, The fermentation facilities were in place but lab and such were not yet complete. Possibly 1969 / 1970? I remained friends with Mr Mondavi until died. He visited South Africa, I visited Napa almost annually and then he got very involved with the International Wine & Spirits Conference. So I would see Mr Mondavi two or three times a year. As for my time at the winery, it was all very educational and made friends for life. 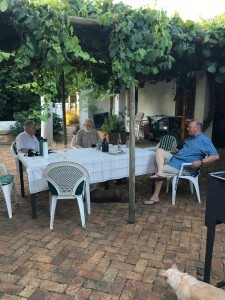 Bill: What makes South African wines unique? Dave: I guess it’s location which gives an enormous variety of growing conditions. But that is the case in most countries. I think South African’s are pretty much of pioneering peoples and so during the years of isolation, they found ways to do things that hadn’t been tackled anywhere else. Nowadays much of what is taken for granted if not originating in South Africa was honed and further developed here. Bill: Cork vs other closures. Dave: I was producing wines in Rhodesia under screw cap in the middle 60’s. As the technology improved I followed screw in preference to cork enclosures. In 1973, I bottled wine under various closures and the wine under a patent screw top developed better than any other closure. In my life, I have been so disappointed by a poor cork that I no longer take the chance. However, when using any kind of closure the application has to be done correctly. I had the pleasure meeting Dave while working the 2016 harvest at Ovebrgaauw Wine Estate in Stellenbosch. We spent many hours conversing over a number of Braais (South African barbeque) and I think Dave is a great person. His life has been devoted to Wine and Sprits. 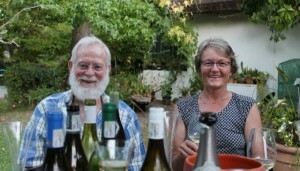 Many winemakers in South Africa call Dave and ask that he critique their wines. His experience is priceless. I look forward to sharing many more glasses of wine and taking it all in. Remember, it’s not a business it is a lifestyle. Our final night in Stellenbosch South Africa with Dave and his wife Lorna.